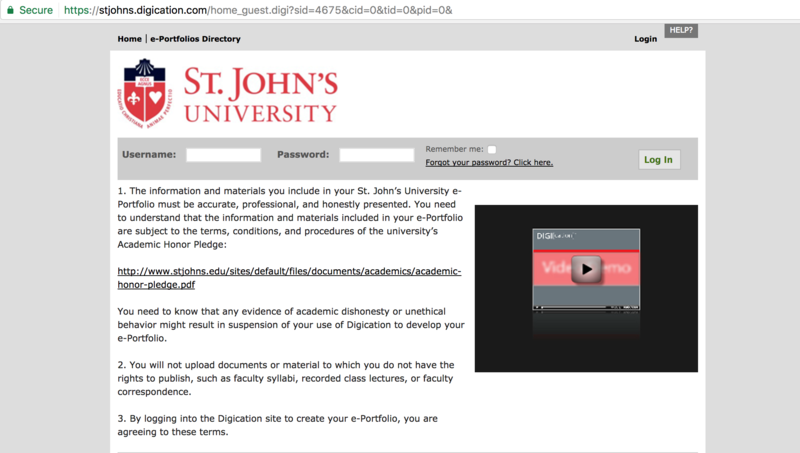 To sign into your Digication account for the first time, enter your SJU email address (without the @stjohns.edu) as your username. Your password is the same as your MySJU password. Once you are signed in, you may edit your user profile profile by clicking your name in the top right corner. Once you are signed into your account, this is the home page that will appear. To create a new portfolio, click the green "create" button on the upper right hand side of the screen. The first thing that is required is a title. This should be something along the lines of "Professional Portfolio of [your name]." Underneath the title space is a list of templates. Select the one labeled DLIS. 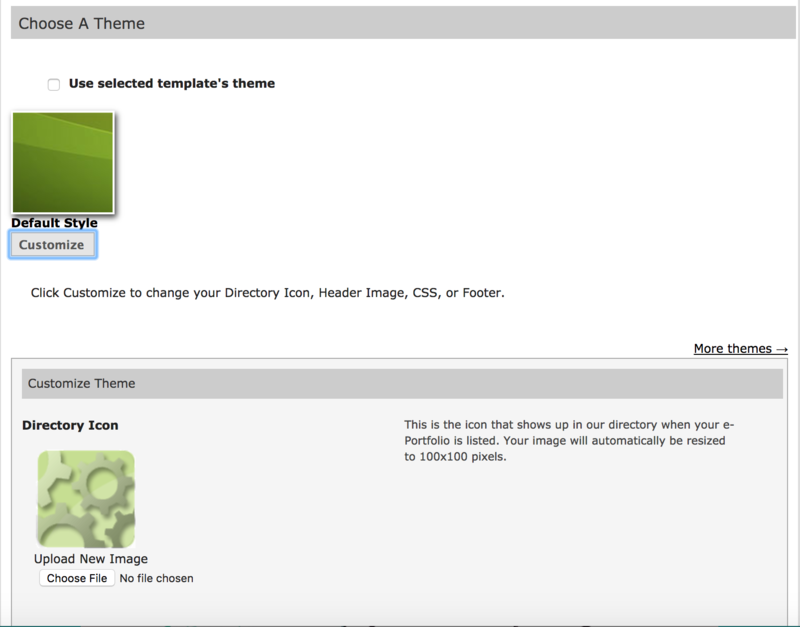 If you would like to customize your theme, uncheck the box that reads "use selected template's theme" and select the customize button. This allows you to alter your directory icon, header image, and footer; you may also choose to change the CSS coding, although this is not necessary. A sample footer is "© 2017 [your name]." Choose a professional URL for your ePortfolio: Lastname-MSLIS is ideal. 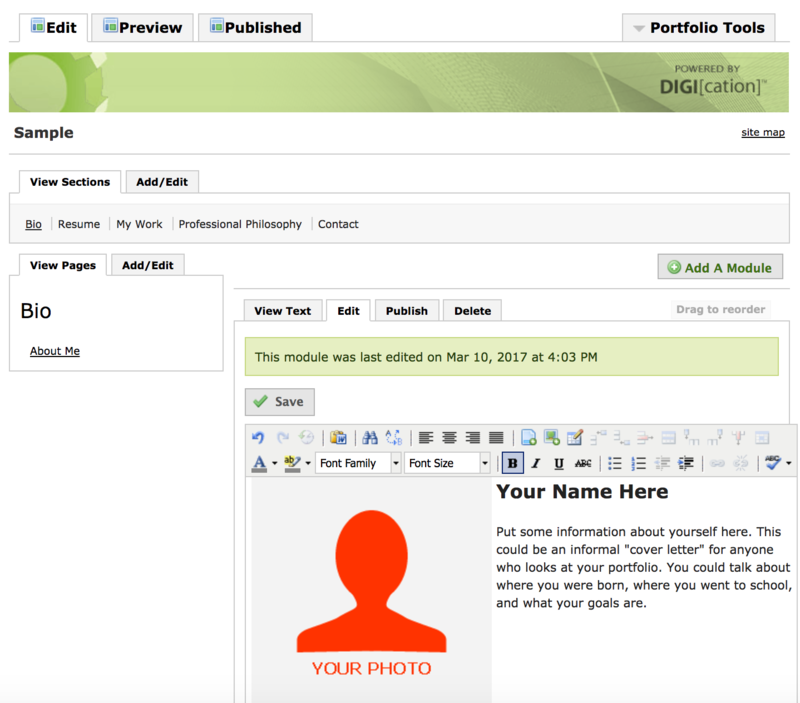 For more on customizing your portfolio, see this area of the DLIS LibGuide. There are three pre-set permission options, as well as a customized option. When working on developing your portfolio, you may wish to keep it private. However, if you plan on sharing the link with potential employers, make sure you remember to switch the settings to public! 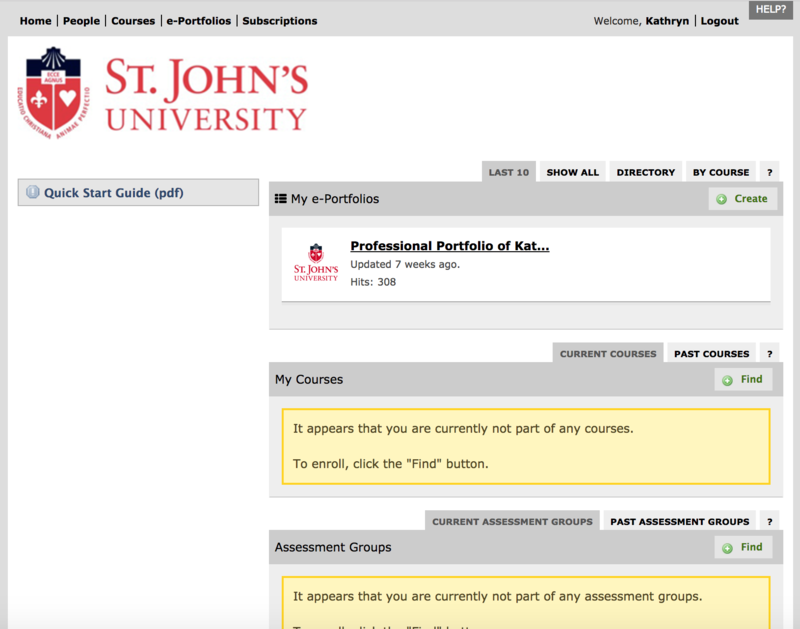 The customizable permissions option is useful if you wish to keep your portfolio private, but are required to share it with a professor as part of your coursework. There are four tabs located at the top of each section's box: View text, edit, publish, and delete. In order to add or change content, select the "edit" tab. Once you have made your desired changes, click the "save" button above the editing toolbar. Be sure to also click the publish tab after you have saved or else the changes you made will be lost. You may choose to copy and paste your resume into the existing rich text module or upload it as a PDF. 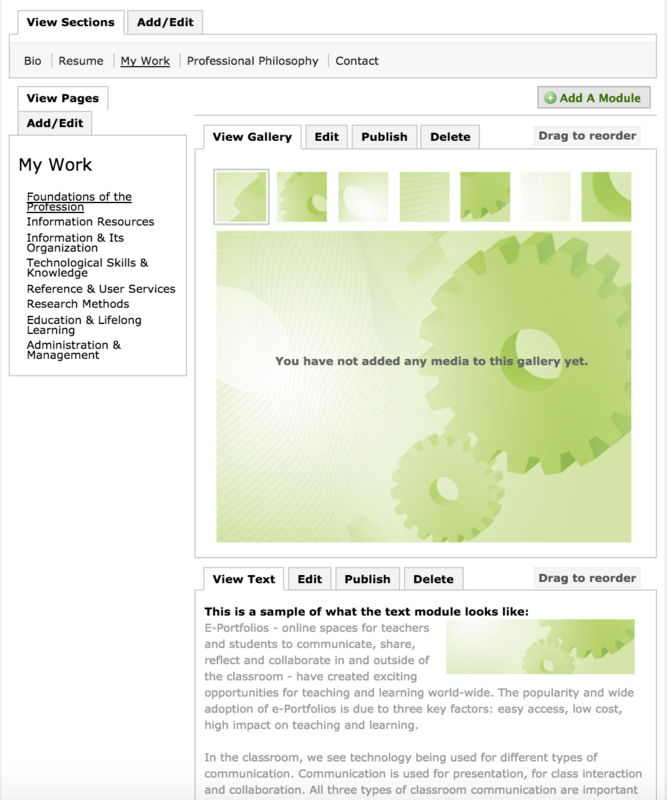 In order to upload your resume as a PDF first delete the rich text module. Next, select the "add a module" button and add an "image/video/audio" module. This will allow you to upload a PDF by selecting the "replace this media" button. This section encompasses the eight program goals as defined by the St. John's University DLIS department. Within each goal, you will place an artifact from one of your classes demonstrating your understanding and mastery of that goal. An image of this artifact may be placed in the media module at the top. You should also include a caption with proper APA citation of your work. Below this, you must add a rich text module in which you will write a description of the artifact and a reflection on your knowledge of the program goal the artifact reflects. 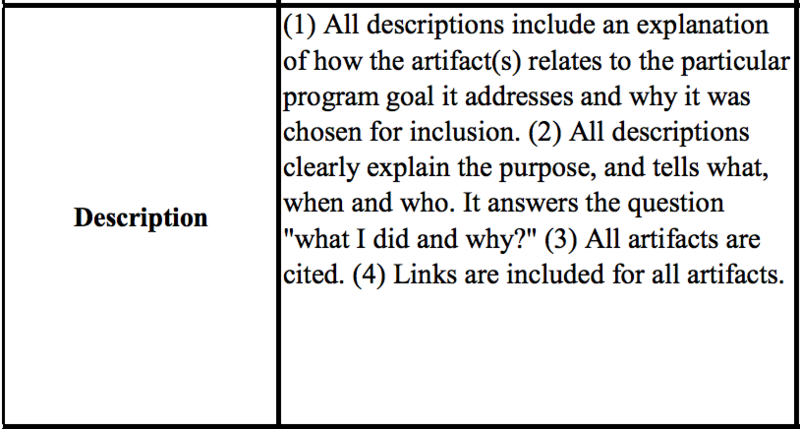 For specifics on what should be included in the descriptions and reflections, see the ePortfolio rubric and guidelines. There should be a separate heading for the description and the reflection to aid the navigation process. In addition to the screengrab of your artifact, you should include either a link to a PDF of the item or insert another media module below your text and include the PDF there. 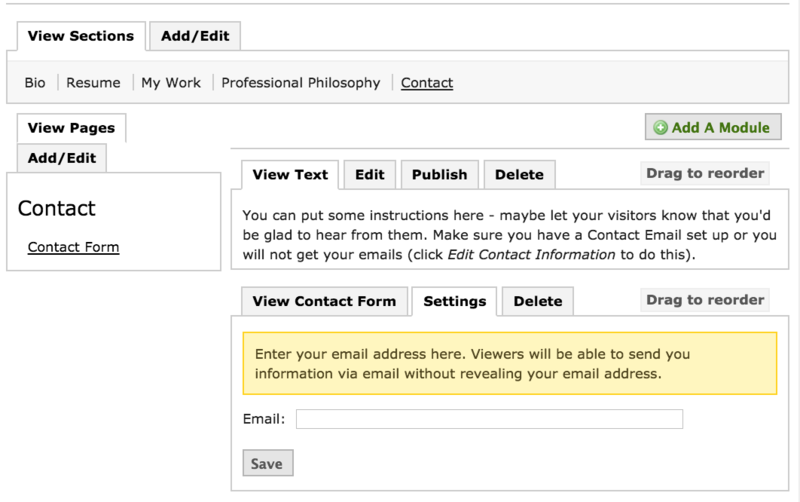 The DLIS template has an email form included within the "Contact" tab. In order to insure you receive emails from visitors who fill out the form, click the "Settings" tab in the contact form module and input the email address you would like to have emails sent to. This address will not be visible to viewers. In addition, there is a text module in which you can leave a message for visitors to your portfolio, encouraging them to reach out with questions or comments. 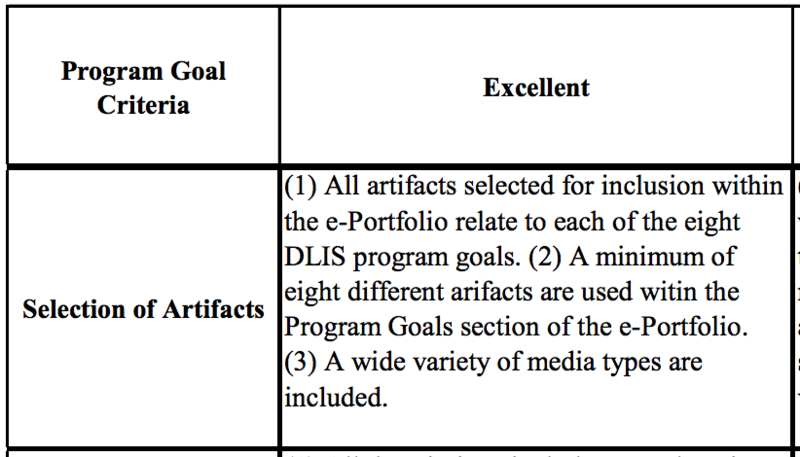 There are eight program goals and each goal section on the ePortfolio should contain its own unique artifact. These artifacts are assignments that have been submitted in class for a grade. 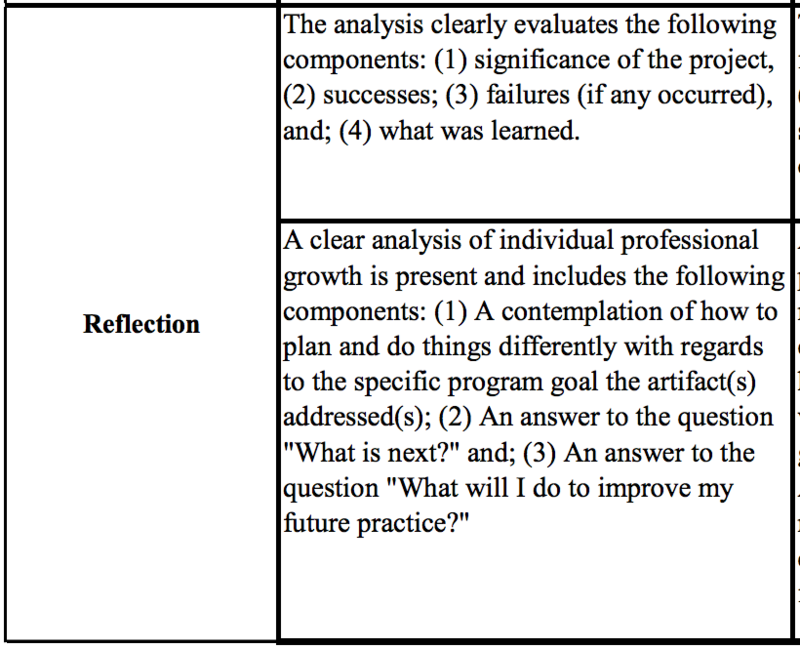 The assignments should not be altered from the way they were submitted; rather, students should include what they would do differently in their reflection. When writing a description for an artifact, be sure to make a connection between the item and the program goal you are including it under. Why did you select this particular item to represent this particular goal? The description should be kept between 200 and 300 words. Be sure to include a link to a PDF of your artifact. For more on how to do this, see the section of this tutorial on uploading content to your portfolio. Within your description, you should include the course title and number, as well as name of the professor, of the class for which you created the artifact. In your reflection you should discuss the significance of the project that your artifact is an end product of, your successes, your failures (if any occurred), and what you ultimately learned through working on the project. You should also indicate what you will do in your future practice as a result of the feedback you received on this project. Are there things that you would do differently when approaching a similar project in the future? Where do you go from here and what steps will you take to better your practice? The reflection should be kept between 200 and 300 words.